In this tutorial we will show you how to configure a new domain for your store. If you have changed your brand name or if you just want your Magento store to be accessible via a different domain name this tutorial will help you to reconfigure your store. First, please make sure that your new domain name is properly pointed to your hosting server and it is configured with your hosting account. This usually includes to have the correct name servers setup and configure your domain name as parked or addon. You can contact the support team of your host to make sure that your domain settings are correct prior performing any changes on your Magento Store. As soon as your new domain name is properly configured, please refer to your Magento Admin panel -> System -> Configuration menu. 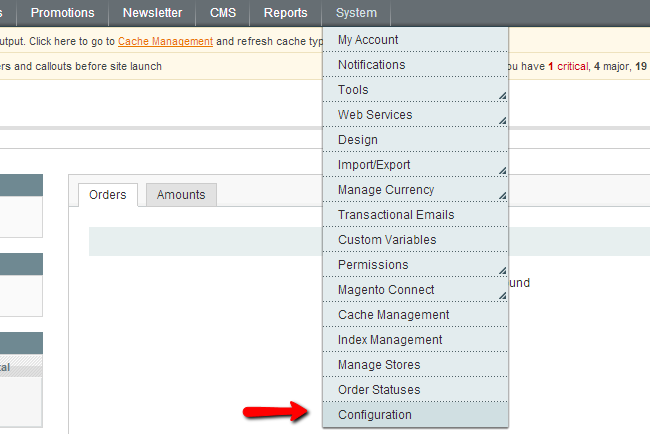 On the Configuration page, click on the Web menu from the left. This will load the page under which you can change the primary domain name for your Magento Store. Please make sure that you have both the Unsecure and Secure URL changed appropriately. When the desired domain name is set, please save your new settings and open your Magento Admin Dashboard via the new domain name.